Scientists have known for decades that black holes exist, but only indirectly. Three years ago, they essentially heard the sound of two smaller black holes crashing together to form a gravitational wave. The image revealed Wednesday showed the edges of the black hole — called the "event horizon" — for the first time. 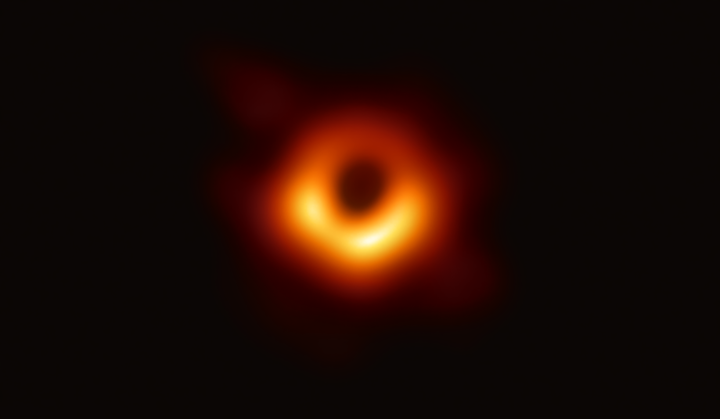 The new image shows a glowing ring that was obviously a black hole and its surroundings, said Harvard's Sheperd Doeleman, director of the Event Horizon Telescope team. "We saw something so true," Doeleman said. "We saw something that really had a ring to it if you can use that phrase." He said the team "uncovered part of the universe that was off-limits to us." Each major astrophysics discovery of the last few decades tends to confirm Albert Einstein's general theory of relativity. It's a comprehensive explanation of gravity that the former patent clerk thought of in 1915 before computers and with much weaker telescopes. It sounds strange to keep saying Einstein is right, but every time his general relativity theory is confirmed, "we kill a cloud of alternative theories" and gain better understanding how to create an even more comprehensive theory of physics, said Ethan Vishniac of Johns Hopkins University. He wasn't part of the discovery team. The black hole that scientists took a picture of is in the center of a galaxy called M87 and it is far bigger than anything in the Milky Way. Its mass — the chief measurement of a black hole — is 6.5 billion times as much as our sun's. The event horizon stretches about the breadth of our solar system. "M87's huge black hole mass makes it really a monster even by supermassive black hole standards," said Sera Markoff, a discovery team member at the University of Amsterdam. Some black holes are inactive, but not this one, she said. And that means it converts nearby gas and matter into energy with 100 times more efficiency than the nuclear fusion that powers the stars. Black holes like these "temporarily become the most powerful engines in the universe," Markoff said. The project succeeded because of international cooperation among 20 countries and about 200 scientists at a cost of $50 million to $60 million, according to the National Science Foundation. To get an image of a faraway black hole, scientists had to get eight radio telescopes on several continents, including Antarctica, to look at the same place at the same time. In getting the instruments connected, they essentially created one Earth-size connected telescope. The amount of data generated was so massive that it could not be transmitted over the internet, so it was flown to data centers by jet. The data collected was equivalent to a lifetime collection of selfies from 40,000 people, said discovery team member Daniel Marrone of the University of Arizona. And just to start to take pictures the weather had to be good at all eight telescopes on the same days in April 2017. The scientists had only 10 days to look and got four perfect weather days, three of them at the start. It then took more than a year for that data to be processed into the first glimpse of images that scientists saw in the summer of 2018. Those images were so good that scientists at first worried that it was just too good to be true, Boston University's Marscher said.